As we see from the chart and discussed in previous post the current bottom made has taken support from a trendlin starting from 12300 . The current correction which was much more deeper has actually corrected almost 61.8% of the whole rally from 12300 to 21k. All the big falls right from black monday hav corrected to 61.8% of thee major rally. A good base formation around these zones for next 2-4 weeks is to be seen possibly . The current upmove has retraced 50% and should further face resistance at 18800-19000 zone after which a dip to lower levels and consolidation could be seen . 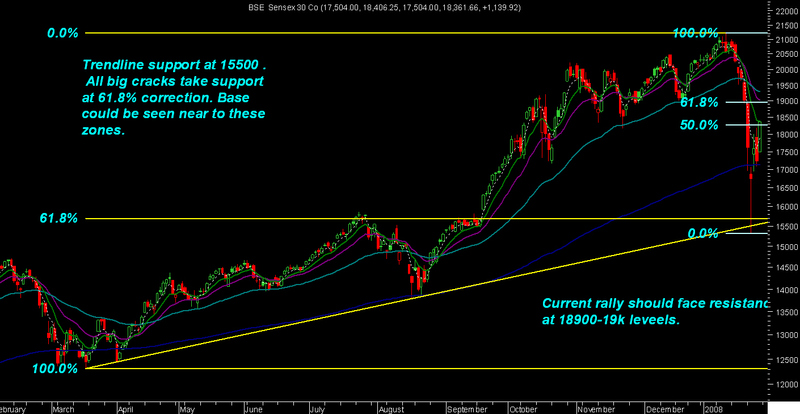 On a weekly and monthly basis 16500 is an important level. Closing below those levels for 2-3 weeks would imply a review of the longer term bull run. As discussed in a chart before this level is an important lifeline area which has not been broken in last 5 years. 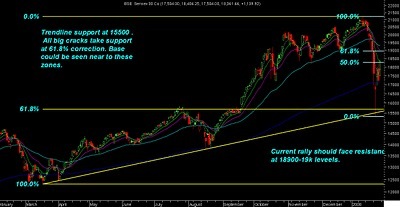 Strategy : Investors and traders who have bought at lower levels should book profits at 18500-19000 zone and wait for stability and range bound moves between 16-18k zone. Fresh buying should only be initiated slowly in staggered way on declines near to 17200 or below as volatility would be high and selling pressure would continue at higher levels. Certain stocks discussed have given a good upmove from lower levels and as part of our disciplined approach as always one should book profits to half or full. 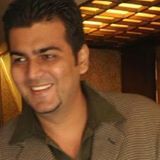 Banking sector has been the only sector which has withstood the current correction and still there is good scope in the longer run. Canara Bank and Central bank look good for value buying in a systematic manner with 1 yr view. Biocon and GTL infra have corrected to good levels and investors with long term view can slowly accumulate the stocks.